I purchased this CR-10 printer, I'm currently printing this project and I'll upload photos when it's ready. I like this, it looks exactly what i need for my CR-10. I'll post my results when its done. What is the difference between the "legs" and "legs with stops" STLs? Do you need to print one of each, or are the stops optional? hi mtrivs. The part with stops prevents the drawer from going backwards and stops it when closing. Therefore, only one should be printed and used for the back side of the CR10 Control box. The other one should be the a normal one (without stops). Awesome, thanks for the info! I have everything printed except the legs and so far I am loving your design. Thank you for sharing this with the community! Nice, good luck and I hope it works well ! The rails might be a little bit weak and bend sideways under the weight of the drawers (especially the lower one, because it's larger), i hope it works fine for you. I might have to find a fix for this in the future. I just received a CR-10s and the control box no longer comes with rubber feet. It now has metal dimples stamped into the bottom plate. Oh ok, thank you for that information! Didn't know about that. 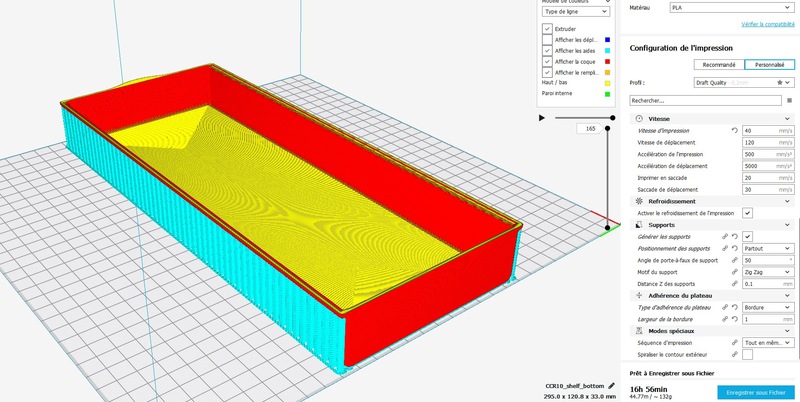 Je suis novice dans les fichiers pré conçus par d'autres mais les tiroir sont trop grand pour être imprimés à plat sur une CR10S ou c'est moi ? Salut tontonchow, c'est normal car il y a effectivement une petite chose à faire pour que ça rentre sur le plateau de la CR10. Ça concerne la technique d'adhésion de la pièce au plateau, il ne faut pas utiliser le mode où, juste avant d'imprimer la pièce, l'imprimante fait un contours autour de la pièce. Car ce contour rajoute un peu de longueur et le tiroir ne rentrera plus sur le plateau. Tu peux utiliser une bordure éventuellement, de 1 mm par exemple, que tu pourras facilement enlever après et ça rentrera sur le plateau. Ou tu peux ne rien mettre du tout, le tiroir est grand et plat donc il attachera très bien au plateau facilement. Dernier conseil, les bord du tiroir sans support tu as tenté ? Good luck pour ton impression. Super :) N'hésite pas si tu as des questions quant à l'impression des pièces. Any Tips for printing the bottom shelf without having to turn it vertically and get a huge amount of wasted support. My slicer is saying it doesn't quite fit even at 45 degrees. If I scale it down to 99.1% I can make it fit but is there a better way? I'd rather no have it just a little bit loose. Yes it's not a good idea to print it vertically and you won't be able to print it at 45 degrees. The default positioning should be fine, you just have to use a short Brim (1mm) instead of a Skirt, and still with supports. I meant 45 degrees as in diagonally across the bed - not up in the air! Thanks for the tip though. Skirts were the problem. That's really helped. I'm glad it helped you, good luck with these long prints ! I'm also used to buy this kind of parts from RS Online. Try to use keywords such as : "Bearing 5x16x5 mm" , and you need 8 of them. Say thanks by giving leplubodeslapin a tip and help them continue to share amazing Things with the Thingiverse community. CR-10 Storage drawer by leplubodeslapin is licensed under the Creative Commons - Attribution license. Say thanks and help leplubodeslapin continue to share amazing Things with the Thingiverse community. You'll need a PayPal account to tip leplubodeslapin. Click the button below and you will be redirected to PayPal. Once the payment is complete, you'll be brought back to Thingiverse.